I have some tesks about Relative Clause. i hope you find them useful, i am not very good at decorating the worksheet, so maybe next time, i will spend more time coloring my w/s. thanks for downloading. The above printable, downloadable handout is a great resource for high school students at Intermediate (B1) level. 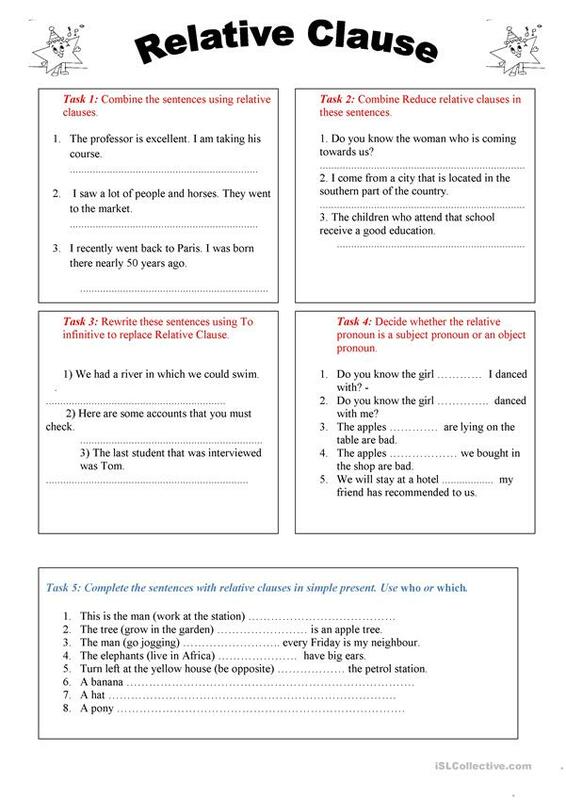 It is a useful material for practising Relative clauses in English, and was designed for working on your students' Writing skills. chipchip is from/lives in Vietnam and has been a member of iSLCollective since 2012-02-27 05:31:50. chipchip last logged in on 2019-03-01 05:52:46, and has shared 6 resources on iSLCollective so far.